This entry was posted on August 19, 2010 at 7:19 PM	and is filed under Side Dishes, Vegetables, Vegetarian. Tagged: balsamic vinegar, basil, cooking, food, garlic, potatoes. You can follow any responses to this entry through the RSS 2.0 feed. You can leave a response, or trackback from your own site. Killer! I made something just like this minus the vinegar.Everyone in this house loves vinegar,so I will be making these soon. Cool, Tim! Let me know how it goes. 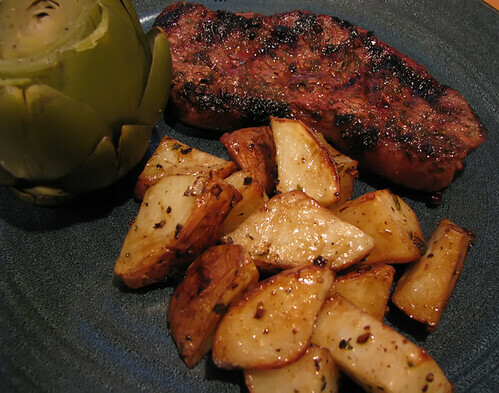 I have often made oven roasted potatoes, but never thought of balsamic! Love the idea and will implement it soon. Thanks, Jane! I think you’ll love it … the whole Cave Clan surely does!! First, I hope everything is ok with your family, your recipes have been missed! 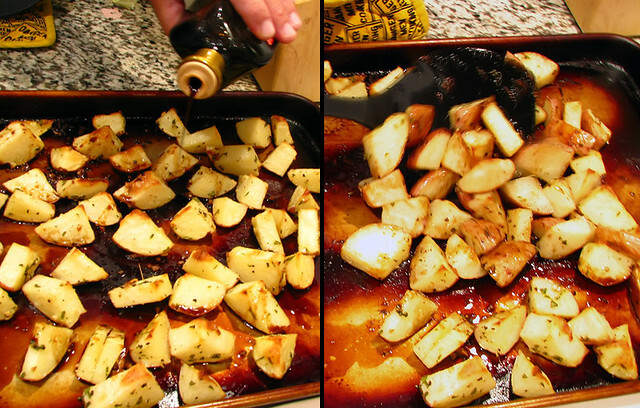 Second, I make variations of this recipe but have never thought to add balsamic vinegar after taking the potatoes out of the oven! Great idea! Tons of vitamins in these potatoes due to the skin being left on. Thank you, Caren! We have a long road to go, but things are looking much more positive than they were a week ago. Give the Balsamic a try, it really adds some killer flavor! made these last night and OMG!! They were WONDERFUL!!! I don’t measure when I cook so I didn’t use the exact measurements that you had listed. Also I had to use garlic powder instead of fresh garlic but OMG they were delicious!!!!! The basalmic at the end is killer! These are going to be making a regular appearance in my meals, thanks for posting! Awesome! Thanks for letting us know how it went, Caren!! Thanks, Kath! Let me know your Twitter handle so I can make you an Iron Tweep!! Wow what a great idea! 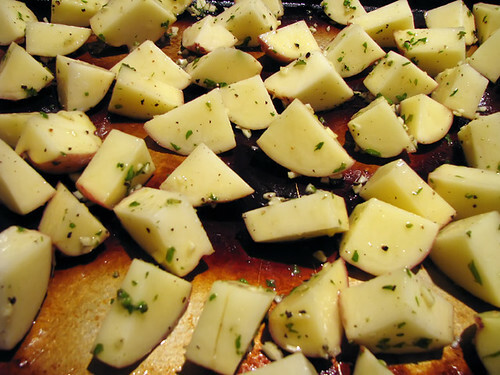 I have never put vinegegar on oven roasted potatoes, but I know it would be delicious. It’s almost like a hot potato salad. Thanks, CS! It really gives those taters a real flavor kick!! Herb roasted potatoes are one of our favorites. One thing that makes them a tiny bit better is when I do them in a preheated cast iron pan in the oven (compared to doing them on a baking sheet). Hope the family emergency turns out okay. I can definitely see how this would become a favorite of your family. It looks delicious! Thanks, Sarah! We love ’em!! Thanks for the recipe. I love simple recipes like this!! Definitely sounds interesting, Aldo. Sending you an email right now. these look so good and so easy! Can’t wait to try them. Thanks, Steph! You’ll love ’em!! I hope everything is Ok with you Caveman! 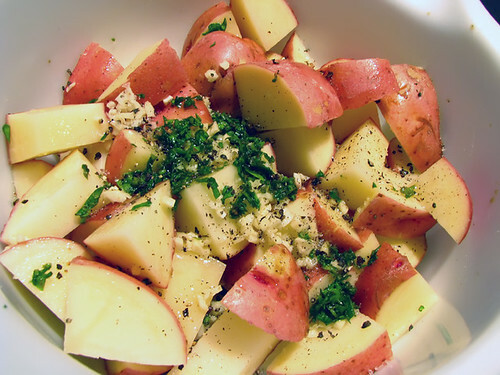 Your taters look delicious – love your idea for breakfast! Thanks, Reeni! I’m good … just need the folks around me to be good, too! Thanks! Let us know how it goes! !